Modbus remains a popular network interface. It is commonly found on jobs such as boiler control, variable speed drives, and metering applications, but these devices lack BACnet compliance. To make Modbus devices appear as individual BACnet devices, a BASgatewayLX is used. This device has one 10/100 Mbps Modbus TCP or BACnet/IP Ethernet port and an opto-isolated Modbus EIA-485 serial port for Modbus RTU or Modbus ASCII devices. Up to 30 Modbus serial devices (represented by up to 1000 polled points) can share the single Modbus port on the BASgatewayLX. 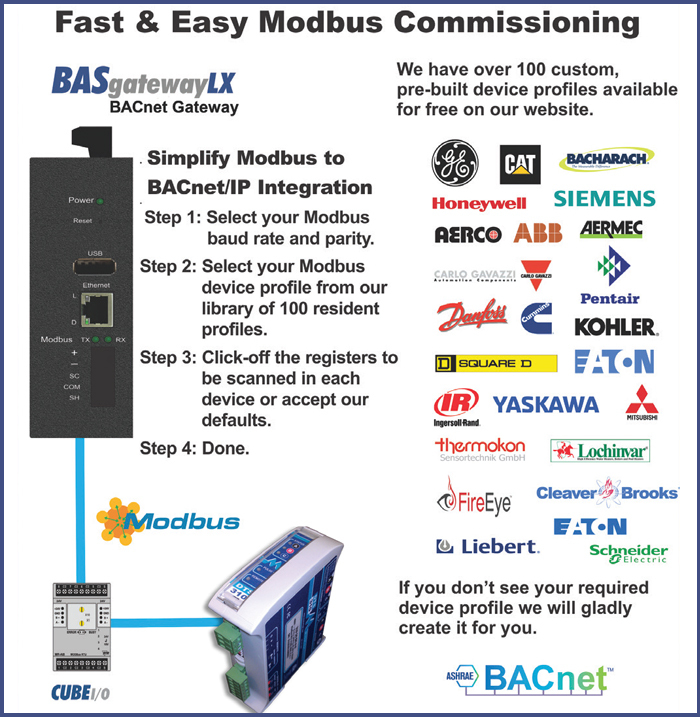 The virtual routing feature in the BASgatewayLX allows each connected Modbus device to appear as an individual BACnet-compliant device. What is needed is a device profile for each Modbus type device. Contemporary Controls maintains a library of common device profiles. If one is not available, Contemporary Controls will provide it upon request. Custom device profiles can be uploaded to the BASgateway. Using web pages and a resident database of common Modbus device profiles, Modbus data points from Modbus Serial or Modbus TCP devices can be mapped to BACnet objects. Visit the BASgatewayLX product page to learn more.